Much of my writing has been on hold because Heberto and I have been creating The Space SF. This endeavor was a long time dream of mine. And a decade long goal for Heberto. Together, we were able to make it a reality. What is the space? The Space has a functional fitness room for personal training and a yoga room for private sessions, small group classes, and educational programs. I felt strongly called to create The Space because as yoga has gotten more popular, classes have gotten larger, shorter, and more oriented towards exercise. The Space SF will be a place for education, diving deep, and exploring the great tradition of yoga. I've had some unique teaching opportunities lately, including corporate retreats, teaching the staff of a homeless shelter, and working with clients referred to me by a cardiologist (we're using yoga to reduce stress and improve their heart health!). Despite how different these demographics seem, my focus has been the same - The Breath. Why? Because the breath is the key to transformation in the body and the mind. The yogis of old dedicated a whole science and system to breathing techniques - Pranayama. To better understand the role of the breath on the body and the mind, check out these articles on the 5 Koshas. Then use the Home Practice Resources to develop your own Pranayama Power. Did you know that almost 7 years ago I created an online course about developing a home yoga practice? This has always been an important offering for me as a practitioner and a teacher. The online platform was too expensive to maintain, however, I’ve been digging through some of the material to share with you. Often the biggest obstacles to home practice are mental. The top four are listed below including ways through and around them! 1. Not enough Time - You never find the time. You make it. For home practice, make it manageable - like 20 minutes. This is the most common obstacle, especially for students who take public classes. There is a persistent belief that your practice needs to be long, like 60-90 minutes, and then you become overwhelmed or discouraged at the prospect of filling this grand canyon of time. My average (asana) home practice is 40 minutes. Yes, there are days of 60 and 70-minute practices but these usually include 10-20 minutes of rolling, a long inversion, or just a slow pace. There was a time when I practiced longer; back when I lived on Maui, worked in restaurants and didn't have computer. However, as my personal life has grown richer, my solo-study time has diminished. And as my meditation practice has grown longer and sweeter, my asana practice has grown shorter. I’ve struggled with this change, however, my teacher says, “congratulations, you’ve graduated”. It's important to remember that asana was not intended for exercise or the achievement of poses. The practice is designed to hone your inner awareness and keep your physical temple in good repair. By these standards, I accomplish what I need in 25-40 minutes. Channels open, mind clear, energy humming. Much more time than that and I feel drained or become distracted. And on that note, I’d rather have 20-minutes of focused and deliberate practice than 60-minute of half-hearted practice. So make the time manageable. In fact, make it so manageable that you’d feel guilty NOT doing it! 2. Not enough Knowledge - Don't know what to do? This roadblock comes from having unrealistic expectations for your practice, in particular, the desire to have home practice feel like a class. It's not. Self-practice and class are very different experiences. Here are a few easy solutions. • Do what you remember from class. • Do a sequence from a book, video or audio recording. • Consider private sessions to help you develop a customized routine. I actually love my home practice so much that classes are difficult for me. I go to class to learn, experience someone else’s perspective, let go and follow. When I’m on my own, my breath is my guide, I listen to my body, commune with spirit and make extraordinary discoveries. To overcome this obstacle, find a sequence to get you started - like training wheels - and allow the home practice to be a completely different experience than classes. 3. Can’t get started - Good intentions and no follow through? Figure out what it takes to just get going. Do you need to start lying down? About 50% of my practices start in Viparita Karani. Are you slow in the morning? When I worked late in restaurants, I would take a brisk walk around the block before practice. Do Sun Salutation light up your energy? During my years of Astanga practice, every practice began with Sun A. Do hamstring stretches make your heart sing? Sometimes it feels so good to start laying down stretching hips and hamstrings. A little-ego lie? Many times, I tell my mind a little lie, something like "do 5 postures" "just what feels good", "it'll only be a few minutes" - then once I've started, the yoga takes over. Timing is also important. What time of day is reasonable for you? When are you able to get to the mat? I have clients who only practice in the morning. I have clients who would love to practice in the morning, but it never happens. They are more consistent and satisfied with their practice when they do yoga in the evening after work. In order to overcome the obstacle of getting started, develop a bulletproof strategy to just get going. Figure out how yoga fits into your life and schedule. Even 5 minutes of mindful breathing and moving is better than nothing. 4. Not feeling “good enough” - In my experience, you do yoga to feel better, not because you already feel good.... For me, yoga is just as critical as other daily practices - like sleep and brushing my teeth - it's a cleanse for my mind, a re-set for my nervous system, and exfoliating for my spirit. There is often another hidden mental hurdle here, and that's the idea that you have to have a “good” practice. Or feel “good enough” to really “do something”. In my opinion, your practice should not depend on how you feel. I believe the practice is too important to be optional. I’m always delighted for my students when they tell me something came up - they were getting anxious, their back hurt from travel, or they felt really down - and then they practiced and it made a difference.This is how you access the healing power of yoga. You practice when you need it, and then you also learn how to use the practice as medicine. So when you're not feeling up to it, consider it a perfect time to practice. Not enough time or overwhelming myself with an unwieldy amount of time so I dawdle and get discouraged. These obstacles are not unique. They are mental whirlpools that spin us around and around. The good news is that by confronting and overcoming these obstacle in one area, you get better in others. You exercise and strengthen the muscles of willpower, perseverance and resilience. And that is powerful. "I think that yoga, rather than a path leading to mastery, is an invitation to evoke mystery and channel a powerful, subtle, and ultimately unnameable energy that roams inside." Below is a home practice MP3 with a sequence like a highlight reel from classes during Spring/Summer 2018. There is a quiet emphasis on opening the psoas - the muscle that connects your spine and legs. In my experience, this muscle is a lynchpin for freedom and fluidity in your body. This 25-minute home practice is complete on it's own, and you could always continue with meditation, pranayama or use this as a warm-up for a longer practice. Click Here to Download the MP3 or listen with the player below. While traveling in Spain this Spring, I had a powerful experience with my practice. I'm calling it my REAL yoga practice because it was so honest, honoring and steeped in deep listening. Does that make my other practices not "real"? inauthentic? or superficial? Absolutely not, however, I find it so easy to slip into the performance of poses and impose goals on my practice. I get trapped in wanting a “good” practice and my mind frequently runs in the hamster-wheel of “doing something” ( like a type of pose or practice... you can insert your favorite attachment here - ex. exciting, invigorating, challenging, backbends, inversions). During travel, my practice gets stripped down to what's essential and truly healing in the moment. It becomes a way to care for my body, manage my mind, and open my heart so I can savor my experiences. These practices are short, basic, and yet profoundly satisfying. Pre-travel - practice focuses on inversions because it makes a big difference with my immune system. Day 1: fresh off a 12 hour overnight plane. Start to get a migraine. Do gentle stretches, legs-up-the-wall for swelling, breathing for headache. Day 2: headache is debilitating. And the pressure/pain means I can’t hang my head. The fascia of my low back and legs is crazy tight. Do some hip, IT and openers uwing the wall to stay upright for my head. Therapeutic postures and breathing to release jaw, neck, and shoulder tension accumulated by headache. Day 3: long train ride today. slight sciatica “electricity” from prolonged sitting. Do forward bends, hip openings and deep core work to alleviate sciatica. Pranayama and Uddiyana bandha to aid digestive system. Day 4: backbends to balance all the sitting! This is the cure for the sciatica. Poses include locust, tiger pose, high lunge, quad stretches, bhekasana, dhanurasana, parighasana, ustrasana, bridge. No forward bends. Not even Uttanasana. You might note the absence of Urdhva Dhanurasana. When my back is questionable or my sciatic nerve is aggravated, I don’t go there because many other poses give me greater benefit with less risk. Day 5: lots of waking yesterday AND we went out dancing. I did legs up the wall when we got home (late night... okay, it was really early morning), when I woke up (it was around noon), middle of the day, and again before bed. This took care of my feet/legs. I also did an evening backbend and inversion practice because we have a 3 hour bus ride to Granada tomorrow. At home, inversions would mean handstand and pincha mayurasana but I just don’t have the energy for those right now. Instead I do headstand with leg variations and half shoulderstand. Day 6: a bus ride is looming on the horizon, so I stick with the backbend practices - tiger, locust, dancer, bridge, etc - to keep the sciatica away. Day 7: bus ride to Granada, lots of walking. I do hip openers, malasana (squat) variations and backbends. Day 8: walking all day at the Alhambra and beautiful Turkish baths at night. Legs up the wall in the middle of the day. Hamstring stretches and low lunges at night. Day 9: another bus ride to Cordoba. The travel and adventure is catching up with me. After seeing all that we can (because we only have a day here) I do legs up the wall and literally fall asleep in the pose. I guess that's all I've got. Day 10: a loooooong travel day. Got up at 6am to catch a train, then a subway extravaganza to the airport, another 12 hours on a plane. I do hip openers before getting on the plane. I had grand plans to do some rolling when we got home but I laid down for a moment and ended up sleeping through the night! Sometimes, rest in a the best medicine. Post travel: First day home, I resume my meditation practice, I could really see how a week without sitting affected my mind. It felt unruly and unkept, like a garden that has been left intended and weeds have gained a foot hold. My body is a mess. My left shoulder is super achy because of carrying bags and leaning to that side on the plane. Right elbow is inflamed because that was the arm where I carried my bag all trip. Low back, hips, hamstrings and calves are super tight. First order of practice is rolling, rolling rolling - for like 40 minutes. Then another 40-minutes of asana. I can't even do Down Dog with my shoulder, however, I'm able to do dolphin, sphinx, spider cobra and that starts to alleviate the tightness. Follow your nature. The practice is really about uncovering your own pose; we have great respect for our teachers, but unless we can uncover our own pose in the moment, it’s not practice — it’s mimicry. As you can see, there is nothing glamorous in these practices. Most were only 20-30 minutes. However, the practice was an invaluable asset. As a practitioner, this is when I fall in love with my practice all over again. Since coming home, I'm striving to keep this deep listening alive and not just on the mat, by also in my choices of activities, food, and speech. It's challenging and rich. As a teacher, I find these practical tools of yoga difficult to incorporate in public classes. How do you train a student to listen to their own body when there is a need to direct a group? Do students become a little handicapped by always having a conductor for their practice? How do you develop an understanding of the postures - the how/when/what/why - during a 70-minute flow? So I'll be honest with you... in modern yoga with big public classes, these skills are developed in workshops, trainings, and private sessions. However, once you've gained an understanding of the mechanics, the "grammar" of practice. You can do the creative work. You can make discoveries in the playground of your own body. You can find your poetry of movement. When you practice on your own, you may feel like you're floundering, or lost, or unmotivated. I promise you, you're just starting to find yourself. With self-practice, classes and precious time with your teachers will become more meaningful; and you'll have a tool to listen, care, and support yourself wherever life takes you. "What matters is how well you have participated in your own life... "
Hey Yogis! During the Spring Semester of Yoga Club we studied the Yamas. These are powerful principles for living your yoga. Below I've compiled some highlights and high-levels teachings to share with you. To Download an MP3 Summary - Click Here. Or stream the summary at the bottom of the post. The Yamas are the ethical principles given by Patanjali in his Yoga Sutras. At first glance, the Yamas seem straight forward. When you actually apply them, you understand why they are considered "Great Vows". Yama can be translated to "restaint" which also communicates that these principles will not be easy. They require a reigning in of energy and impulses. And while these principles seem like common sense, they are far from common practice. Yoga asks us to make these principles a DAILY PRACTICE - just like meditation or asana (postures) - and then each interaction, conversation, and moment exercises the muscles of the spirit and reduces suffering. If you can commit to these great vows, the Yamas bestow the treasures of peace, honesty, satisfaction, abundant energy, and self-sufficiency. This moral code for yoga practitioners is not unique to Patanjali. Following principles like the Yamas & the Niyamas were a prerequisite to practice in traditional yoga schools because they imprint a way of being before a practitioner starts doing. In Modern Yoga (and a culture obsessed with doing rather than being), these teachings can fall by the wayside even though they are perhaps more important than ever. On and off the mat, the Yamas bring depth, direction, and wisdom. Notice the order of the Yamas because they always refer back to one another. For example, Ahimsa is the foundation and first ingredient for living in yoga. So when you practice Satya, truthtelling, Ahimsa must be taken into consideration. Even if it's a tough-love, potentially-painful-to-hear-type of truth, you practice ahimsa by delivering the message with compassion, calm, and courage. Ahimsa is non-violence, non-harming, non-injury. This sounds simple at first - don’t hurt people - however yoga wants you to go deeper than that. For example, do you ever say things that unintentionally (or intentionally) hurt others? Do you have thoughts that are injurious or violent? The yoga tradition sees no difference between thoughts, words and actions. As Krisnamurti said, “the war outside is the war inside”. Ever have a war going on in your head? Ahimsa is the antidote to this war and you can start practicing in your poses. I think of my mat as "the microscope" where I can focus, examine, and transform my inner landscape. For example, when you practice, what is your inner voice like? Is it compassionate and kind? Or aggressive and intense? Is it resigned or discouraging? Inner listening expands your awareness and turns your physical practice into a meditative endeavor that increases your capacity for Ahimsa off the mat. In the outer world, practicing Ahimsa is how you treat others, including the long-range ripples of your actions into the greater ecosystem of life. The practice of Ahimsa can be a reason for becoming vegetarian or choosing ethically-raised and environmentally-sustainable sources of protein. Everyone has to decide for themselves what is appropriate and ethical to consume. In my opinion, just as important as food, is how and what you choose to consume as commercial goods and media. For example, are your clothes, shoes, and furniture produced under ethical circumstances? What about your cell phone? Are you consuming violent news or entertainment? Do you read or watch things that generate feelings of anger, chronic frustration or despair? Ahimsa is the recognition of interconnectedness. It is a visceral understanding that your thoughts, words, and actions have an impact. Ahimsa not something you perfect, it's a practice, and Yoga says that when you truly practice Ahimsa, you become a vortex for peace. Great leaders like Mahatma Ghandi and Martin Luther King are examples of creating powerful and positive change with this principle. Below is a lecture on the 5 Yamas given by Patanjali in his Yoga Sutras. To Download the Summary - Click Here. Sun Salutations - you do them almost every class...but why? where did they come from? Are they more than just exercise? They can be.... Below is a brief lecture from the Secrets of Sun Salutation Workshop and also a 12-minute Home Yoga Practice MP3 guiding you through classical Surya Namaskar. Learn about your lineage. Discover myths and metaphors to make your practice more meaningful. Change your perspective to change your performance. Patanjali's version of Yoga is quite different than "modern postural yoga". So is this text still meaningful and relevant? I think so. However, you have to do a little translating to make the text culturally and historically relevant. Asana – often translated to "seat". Asana can also mean abiding, dwelling, inhabiting. The emphasis here is being present, grounded and committed to whatever you are doing when you are doing it. Sthira – steadiness, strength, to stand or to be firm. It has a relationship to the Sanskrit word Asthi which means bones. Your bones are the support for your body. In posture practice, when you align with the architecture of your bones, there is release in the muscles and space in the joints. Sukha – Often translated to easeful or joyful, agreeable, and gentle. The word literally breaks down to "Good Space". When you first create steadiness through your bones, then every movement has grace and ease. The joints sing with space and the muscle sigh with support. Want a little more insight? Here is a 15 minute lecture about Patanjali's instructions for "Asana" and how you can translate it for your practice. Below the lecture recording is a Home Practice MP3 based on a Stira-Sukham class from Yoga Club. 25-minute breathe better MP3. Recorded during the week-long wildfires in California October 2017. Interested in studying Patanjali's Yoga Sutras? Overwhelmed by the choices? Which book is best? Each book will have the author's flavor and perspective. Here are a few of my favorite resources for different levels of interest and experience. I feel like I was a walking head before yoga. Even though I played competitive sports and was active, I wasn't really communicating with my body. Oh, there were plenty of commands - run faster, you can do it, no pain, no gain - but very little conversation. When I first started yoga, it was like I had to translate everything - put your left foot forward... okay....left.... foot... where is my left foot?... now, forward... more forward... come on left foot! ..... why doesn't it get to the top of the mat? ... - Anyone else have that in their head? Progress was slow, but progress came, and it came more quickly once I understood the role of the breath and the bandhas. It's like you come to yoga with a "flat tire" for a body - even if you're active, there is rarely awareness. The yoga postures and alignment start the conversation. You begin to feel - which can be as simple as equal weight on your feet, as subtle as the stacking of your bones, or as complex as the emotions that arise when a pose is challenging, unfamiliar, or uncomfortable. And as you begin to feel, your inner awareness unfolds, reaching ever deeper, to subtle concepts like the bandhas. As seals, the bandhas patch up "leaks" - weaknesses, sleepy deep core muscles, underutilized stabilizers - and strengthen you from the inside out. The bandhas also create more of a container inside of your body. 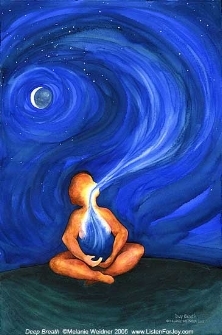 Which is why they are a prerequisite for pranayama - breath expansion practices. Pranayama comes from two words. Prana which is life force, vitality, eternal energy. It's like Qi in other Eastern Traditions or Mana in the Hawaiian Tradition. Ayama means to liberate or remove restraints. When you dissect the word, you see that pranayama is designed to invigorate, expand, and liberate the life force and energy inside of you. Once the breath has a strong container, a solid vessel, it gains momentum. Then you pump prana into the body. Prana creates space and potential for something new to arise, for transformation to occur. It inflates and enlivens your body with awareness. Instead of clunking along with a flat tire, you cruise, glide, and really ride the vibrancy of being in-body. This is how yoga makes you more youthful and vital. This is what sustains your practice for a lifetime. This is the alignment of feeling uplifted inside and out. "Without full awareness of breathing, there can be no development of meditative stability and understanding." What are the bandhas? What is the deep core? Are they the same? Here we explore the diffference between the bandhas, the deep core, and learn how to activate Mulabandha, the root lock. highlight reel of my favorite books over the years. This is the "Clear Blue Sky" Visualization Meditation from the Ajna "Command" or 3rd Eye Chakra Classes. Just like there are many different poses, there are many different practices and "shapes" of meditation. There are meditations on the breath, loving kindness, or walking. With visualization meditation, you turn your sense of sight inward and utilize your imagination to expand your perception. This was recorded during class and is only about 6 minutes. I recommend setting a timer for the amount of time you want to meditate then use this recording to get you started. Download the MP3 File by Clicking Below.